Layers are cut all around the back and sides of this bold red mane to balance out the bounce and body of the curls. 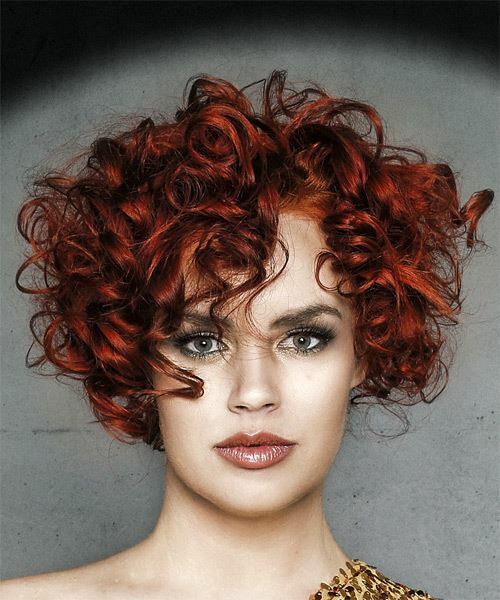 This short easy style is best suited for those with naturally curly hair and is perfect to frame a long face. Regular trims will help prevent split ends and product is needed to tame fly-away hair. Our model looks stylish here in a short curly hairstyle that shows off her best features. This cut is ideal for ladies who want to work with their hairâ€™s natural texture rather than against it. She has an oblong face and large, wide-set eyes which are nicely framed by this â€˜do. She also has a high, broad forehead that is camouflaged well by the layers around her eyes that create a fringe. Her strong cheekbones are also enhanced by this short curly â€˜do. This hairstyle would look gorgeous blow-dried sleek and straight for a different look that would still flatter her face shape, but looks great in curls for a chic, eye-catching look. Our model's color is another stand-out feature of this hairdo. Having an olive complexion and green eyes, she suits rich brunette, auburn and red tones the best. Here she opts for a blood red tone that works well with her eye color and complexion. The texture of this haircut is nicely set off by the color and completes her look brilliantly. Regular toning treatments are needed to keep this color looking fresh and to reduce fading, which is common in red hair. Scrunch pomade or curling wax through the hair for a shiny, healthy finish.